A recent McKinsey white paper argues that artificial intelligence is broadly impacting the asset management industry, not only transforming the traditional investment process. 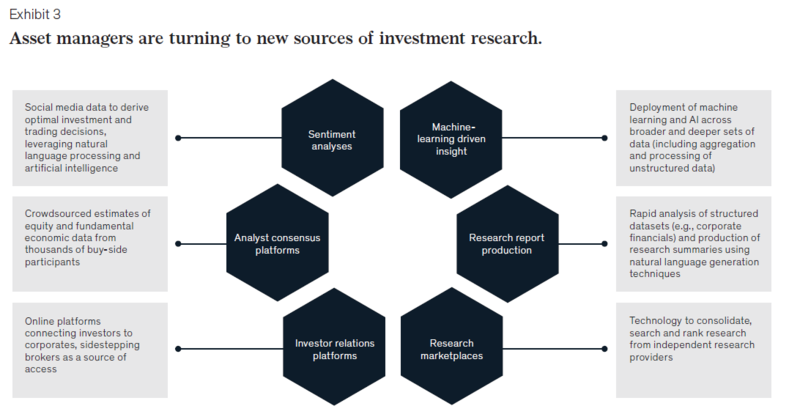 As more asset managers bring AI in-house, the demand for external research products will shift as internal machine learning subsumes external analyst and sales roles. 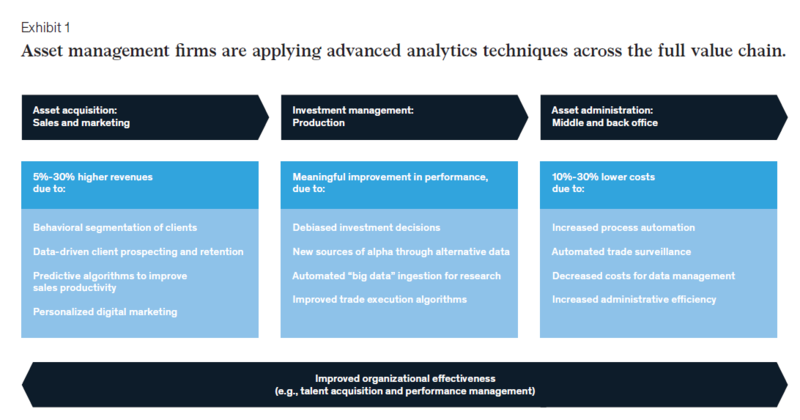 In “Advanced analytics in asset management: Beyond the buzz”, McKinsey reports that AI usage has accelerated over the last two years and is now being applied in a wide range of areas within asset managers: “A broad set of firms are embracing new analytics methods at multiple points across the asset management value chain—and beyond the alpha-generating use cases favored by quant firms.” Although investment management remains a key use case, AI is also being utilized to improve product distribution and create operational efficiency. Improving investment performance continues as a primary goal, with AI facilitating the use of unstructured alternative data sets. McKinsey cites a leading real estate investment manager which combines Yelp reviews, information on traffic flows and credit-card transaction data with traditional property-and market-level characteristics to forecast three-year forward rent forecasts as an additional test before investment decisions are made. AI is also being used to monitor the investment behavior of portfolio managers and analysts, drawing on an individual or team’s trading history, communication patterns, psychometric attributes, and time-management practices to flag potentially detrimental trades that fit predefined patterns, and double-checking them before execution. Perhaps most worrying for external research providers is the increased use of machine learning to automate the ingestion and analysis of public filings and to highlight changes in sentiment that internal investment staff can focus on. At the same time, McKinsey cites use of natural language processing (NLP) to create real-time research summaries based on earnings releases and other corporate financial data. McKinsey’s findings correspond with other surveys, such as EY’s 2018 Global Alternative Fund Survey [link requires subscription] which found that hedge fund usage of artificial intelligence was increasing dramatically as the majority of hedge funds are adopting alternative data. A recent survey by Element22 [link requires subscription] estimated that large asset managers were spending around $10 million a year on artificial intelligence and alternative data while the very largest firms were spending an order of magnitude higher. There will continue to be a role for external research analysts, but it is being narrowed and cheapened by new technology. Earnings notes are increasingly extraneous in an environment where machine learning allows the buy-side to parse financial results quickly and efficiently. Firms like Sentieo [link requires subscription] are seeking to make buy-side analysts self-sufficient during the frenzy of earnings season, relying less on brokers and independents in the process. Sell-side analysts have the luxury of covering fewer stocks than their buy-side counterparts, but that advantage is being whittled away by artificial intelligence as analytic efficiency improves. At the same time, sell-side analysts will increasingly depend on similar AI tools as research departments seek to become more efficient and improve profitability. In some cases, this has led to more juniorization of sell-side analysts as senior analysts depart or are let go. The bank model of charging low fees for written research and premium fees for high-touch services such as analyst access to some extent anticipates the hollowing out of external research as the buy-side increasingly automates. However, external research providers will need to go further in retooling research product to fully adapt to the coming new realities.